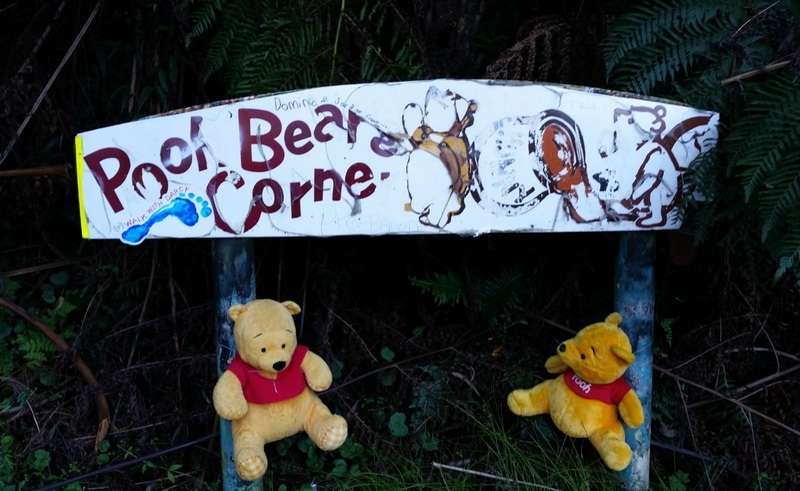 Winnie the Pooh burrowed all the way down to Australia for some quiet time at his holiday house, the Pooh Bear Corner. 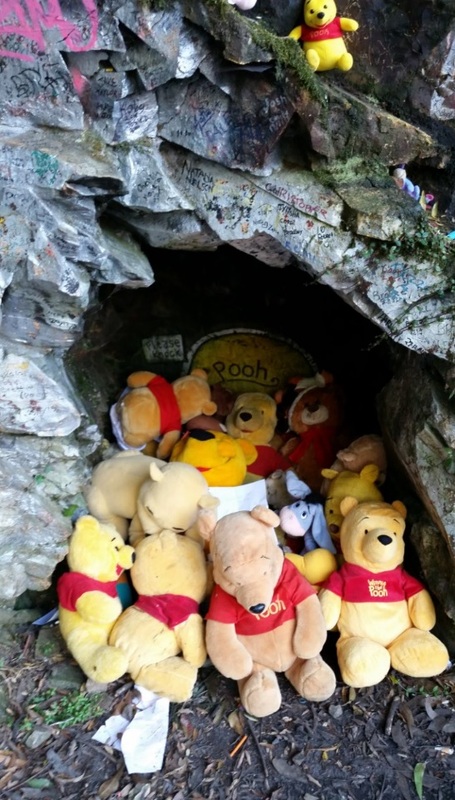 This grotto has been described as “…a particularly treacherous bend where lives Pooh with reflector eyes.” (Shanahan) – but really this is just people falling for his security system. A bear needs his privacy, hence the bear multiplicity, mimicking the Santa-everywhere phenomenon. Winnie appreciates the cave’s views of the Clyde Mountain, easy access to major roads, and rainforest vista of ferns and mossy steep cliffs. Sometimes he dreams of a time before he was reduced to a commercialised set of lines, remembering that he was somehow, a little rougher around the edges. 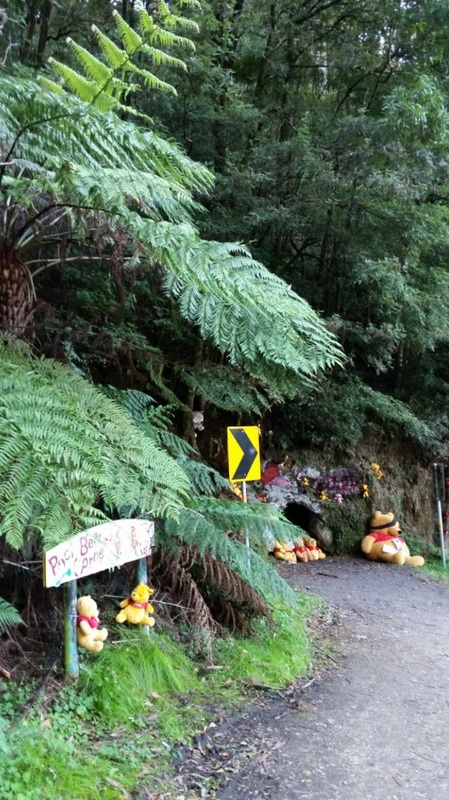 We drove down the hill past Pooh Bear Corner many times for childhood holidays, but it was deemed “too unsafe” to pull over and see the cave. It had a wooden sign, and I’m not even sure if there were very many Winnies residing there in the 80s and 90s. Was it this version of the welcome sign? Now my recollections wobble as to which iteration marked the hideaway – that strange incorporation of photos as memories. Sulking, we watched as the Corner blurred past on the way to our coastal holidays. I stopped at the Corner last month, fulfilling a childhood dream, but also shattering it a little in the process. It wasn’t as far along the mountain as I thought – the distance had reduced even though the space between the years had expanded. Stepping over vines and tanbark, I held aloft the bubbled ideal of the cave, hovering over an imagined and real pedestal of the mountain. The bubble drifted, caught on an overhanging tree branch, one hundred crystal glasses exploded and my love for the cave decayed into a carpet of glinting shards on the ground. The sign was faded and fractured, an antique crackle effect over the text, children’s scribbles at the edges. The silhouettes of the famous bear devouring honey seemed melted, perhaps still from last year’s car accident. 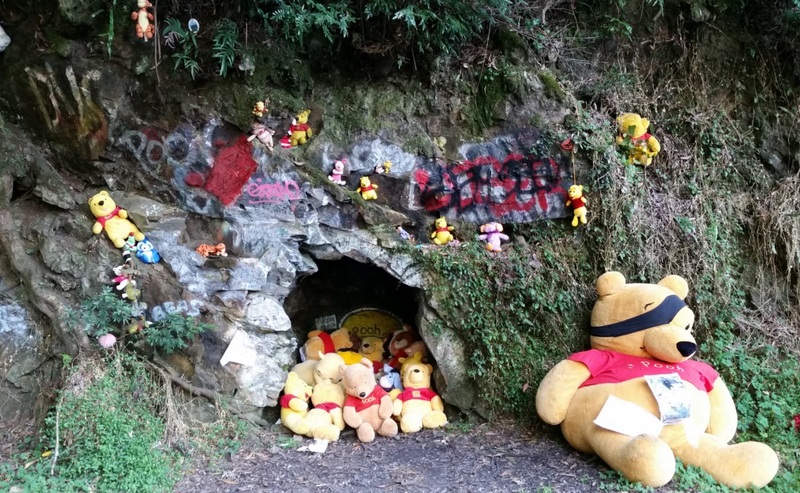 Winnie’s clan had grown beneath the mantle of the cave (but without wombats), rocks spraypainted luminous silver, names and tags growing outwards from the hollow like a wreath, like tears emanating from a quiet room, as though rippling and spilling across a river that carried a game of Pooh-sticks. The cave is reigned over by a Pirate Winnie, eyepatch stopping him from quite seeing all his brethren in the rainforest hollow, but retaining enough sight to watch the traffic and guard his post. I wonder if, despite his interminable watch (a la Fry’s dog waiting), he might transition to being whole-bodied, astral travelling back to walk in the Hundred Acre Wood, near Ashdown Forest. “… they’re hitching their way to the teddy bears’ picnic at Pooh Corner on Clyde Mountain…” – Matt Bennett. I told my friend J, who lives below the mountain, about the gap between my expectations of the cave, and the reality of the Pooh Bear Corner. She suggested it had become a “Pooh ghetto”, which is painful, but that’s what it is. There was a clean up of some graffiti 6 years ago by a local radio station, but maybe the Eurobodalla Shire Council will refresh the area? I can still remember when Pooh Bear Corner felt like a secret punctuation in a journey, a chance to see a story come to life. For families who now travel past it without stopping (even if they wish otherwise), there is still time for the Corner to regain that mystery-filled state of fairytale joy and magic on the mountainside. Al-Othman, H. (6 June 2016). Hundreds compete to become world Pooh Sticks champion. London Evening Standard Online. Bennett, M. in Column 8 (8 January 2009). The Sydney Morning Herald, 14. Accessed via Factiva on 27 June 2016. Bunbury, S. (12 December 2014). Bonneville having to grin and bear it. The Southland Times, 8. Accessed via Factiva on 27 June 2016. Pierpont (27 October 1995). In which Eeyore is told where to invest. The Australian Financial Review. Shanahan, A. (16 December 2000). Byzantium on Burley Griffin. The Australian. 21. Accessed via Factiva on 27 June 2016.